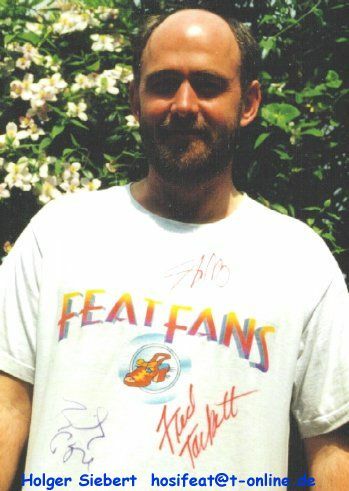 Jens Staugard from Denmark Email has written a review and compares the two Rockpalast concerts of Little Feat. This contact was made by one of the greatest European LF fans - Holger Siebert Email - who is looking for contact to other LF fans. After seeing the two Little Feat concerts a couple of times, a lot of things shines through: The 77 concert is very tight and Lowell George has a very strong on-stage presence, with the rest of the band concentrating on being the great musicians they are. At this point in his life, George is heading in a different direction than the rest of LF. Still they appear to be a very tight unit. What makes the 77 performance outstanding is the raw, funky bluespower of the music, George's vocal and his exceptional slide playing. The rest of the band with Bill Payne as mainman incorporates a jazz-rock element into the show, with a great version of "Day at the dog races". Again LF presents a welcome surprise, because they master this element with technical grace and raw, hypnotic power. The final number, a tour de force of "Rocket in my pocket" makes a great conclusion to a fantastic set. The 95 concert is much different - the sound is wider, more open, rich and a couple of tracks they have improved a lot playing live. The overall feel is relaxed and the band appears mature. The jazz-rock element is substituted for a cajun influence and a small unplugged set, in the middle of the concert. The unplugged set is fine for the acoustic picking of Paul Barrere and Fred Tackett. The sound is dry and the feeling is that of tradition and back to the roots. Hardly a step forward, but a fine example of how capable guitarists they are. Shaun Murphy is an interesting addition to the band. She has a strong on-stage presence like George. She's a fine singer, with a strong and raw vocal. Unlike George's unique phrasing she stays within her tradition. Most of the time she's a natural focal point within the band. She really shines when she breaks in and takes the lead vocal on "Fatman in the bathtub". And of course her wonderful rendition of "Long distance love". Her "duet" with Sam Clayton on "Feats don't fail me now" is a treat and a surprise version of this crowd pleasing sing-along. Shaun adds a new dimension of female counterpoint to the material she's handling as well as the whole tradition of LF. She gets a lot of attention from the boys, and she deserves it. 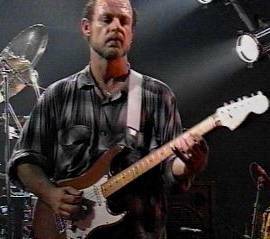 The onstage presence of Paul Barrere in 77 is that of a happy guy playing killer guitar, launching one classic riff after the other. Later in 95 he appears as a hardworking, but also relaxed frontman. His guitar playing has matured a lot through the years and is great throughout. He even reinstated the slide part on the chorus of "Fatman in the bathtub" . (Lovely, please play it loud next time.) Paul's ability to be the frontman one minute and the next an excellent accompaning musician is remarkable. His touch of understanding gives the rest an opportunity to shine, thus freeing some of the many resources within the band. Bill Payne is a great keyboard player. He doesn't appear as a frontman that often, but has the ability to make some very complex and creative fills and textures within the frame of a deceptivly simple song. When the focus is on Bill you're sure to hear an expert at work. A masterclass musician playing the music he loves. His vocal contributions are few and far between, but when the mike's turned on, you realize his vocal has great potential. (For reference check out the studio version of "Gringo".) Without Bill there probably wouldn't be any LF, but like the best of leaders, he lets his co-conspirators play to the best of their abilities, making room for a varied and complex musical sound. 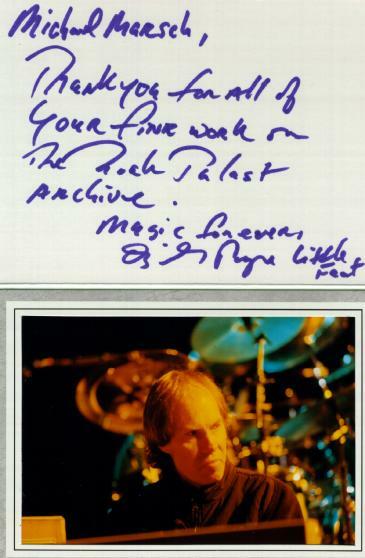 Fred Tackett, an old friend and guest musician from the early days, joined LF, when they reunited for the "Let it roll" album in 1988. Fred is a great guitarist and trumpet player as well. On-stage he sometimes appears Buddha-like. Always being the centered sideman: Keeper of the keys when everybody takes of. The rhytm section of LF is pure dynamite. In 95 their interplay, funk and bop is matched only by the best. Richie Hayward is a powerstation of technical finesse and complex boogie. With Kenny Gradney on fat, funky bass and Sam Clayton never overdoing the percussion, the sound is tight, rich and full of surprises. The precision of their interplay is outstanding in a world full of stiff and uninspired rhytm sections.They are the Rocket in Little Feat's pocket. In many ways the 95 concert is better than the 77 concert. The utilization of the individual members abilities is better balanced, although the more recent material sometimes lacks the quality of their early classics. The 77 concert is more tight and focused, with the band probably at their creative height. Nevertheless, both concerts are fine examples of tremendous energy and exquisite musicianship, from one of the finest bands, this planet will ever see. Little Feat DVD - Highwire Act: Live in St.Louis 2003 bei Amazon bestellen! Live from Neon Park Doppel-CD - bei Amazon bestellen!